The most progressive organizations are adjusting to the trend that’s defining 2017: The war for the mindshare and share-of-wallet of each customer will be won on the battlefield of customer experience. How can brands create a winning experience? Let me back up for a moment. I’m in the middle of an incredibly interesting book called Zag: The #1 Strategy of High-Performing Brands by branding expert Marty Neumeier. The premise is that when everybody “zigs,” you “zag.” This concept might sound abstract or vague, but it’s actually pretty simple and logical. “Of course,” most business leaders would say, “we should differentiate ourselves from others in order to be competitive and increase [X, Y, and Z].” But the more time I spend ruminating on this idea, the more I realize that this supposed effort toward “differentiation” almost always manifests in small (and ultimately insignificant) changes to the business or the customer experience. Once a brand is established, it’s really hard to change. “Zagging,” to me, means identifying the outward-facing facets of your brand, then letting your true identity set you apart from everyone else. Instead of slightly diverging from the competition, it means taking a giant leap miles ahead of anything they’re doing. It means keeping focus on the people who actually buy your stuff, and creating an unparalleled experience for them. Could there be more to customer retention than affordable prices, friendly staff, quick customer service, and great product functionality? Though those facets are pivotal, I propose an extension of that concept: Those who refuse to conform, who pave their own, one-of-a-kind path forward—guided by the customer—will ultimately reap the richest rewards. What if this mentality was embraced by more of the companies we do business with, the places we eat, and the stores where we shop? What would that look like, and is there actually business potential there? As customer experience industry expert Mike Wittenstein described, there is much research to support the correlation between enhanced customer experience and increased revenue. Now it’s just a matter of creating a little separation—a little distance. In his book Experiences: The 7th Era of Marketing, my favorite marketing and customer experience expert Robert Rose explains how we’ve recently moved into the next evolution of marketing which he describes, simply, as “experiences.” Rose goes on to write about crafting remarkable, content-driven experiences, but he’s right that we’ve entered an age where experience is the primary competitive differentiator. It’s 2017, and as Gartner alluded to, customer experience is truly the new X factor. It’s time to focus on creating memorable experiences for customers. We live in an age where the companies that bring the most unique value will win. It’s an experiential world, where the distinctive brands thrive and the cookie-cutter, same-as-everyone-else companies crack and crumble. There’s something about a new experience that disrupts our expectations which monotony and routine have created, and instead creates a novel flavor for a loyal brand advocate waiting to happen. We can learn a lot from companies that are actively distancing themselves from others by creating their own kind of customer experience. These innovative brands are using resources they have available to carve their own path. They understand what it means to be a pioneer, and that if you can manufacture memorable interactions that only your brand could offer, then you have no true competition. Zappos sets the bar for a truly differentiated customer experience. The contact center at Zappos looks more like a Party City than a corporate call center. That’s because more than any other brand, Zappos embraces the individuality of its employees. Zappos encourages employees to be creative and decorate every inch of their space. That sort of philosophy also translates through its vision and its customer service philosophy. While its agents champion the company’s culture, its customers are the real heroes. Zappos empowers customer service reps to aim toward only one contact center metric: complete customer satisfaction. It doesn’t use restrictive call scripts, has little corporate red tape, and few rigid policies. It expects agents to serve as an extension of its quirky, cool culture, and to serve the customer in the way that best meets their needs. It’s different. If talking with a customer for hours moves the needle toward greater satisfaction, employees are encouraged to do so. It’s all about going the extra mile. And that’s what people love. People initially gravitate toward experiences that are consistent with their original or existing point-of-view, but they subscribe to or continually consume content and experiences that are contrary to it or which challenge their original belief. 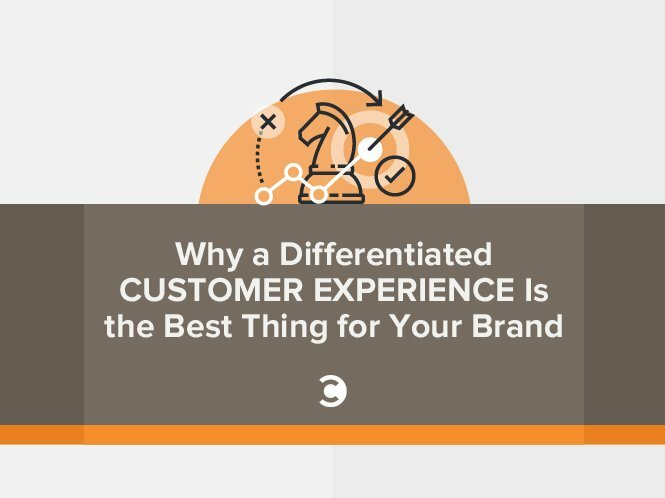 Creating a differentiated experience requires you to surrender yourself, in a way, to understanding that you’re not going to please every customer. Being unconventional isn’t for every company, certainly, but it’s a surefire way to zig when everyone else zags. Talk about breaking through the clutter! Numerous other companies embody this concept in their own way. Google, Jungle Jim’s, and Ripley’s Believe It or Not! Museum, for instance, all pride themselves on philosophies and tactics—both in terms of workplace culture and customer experience—that would probably embarrass other brands. But these cultural and customer-focused characteristics are precisely the engine that propels each forward. I’m not suggesting companies ought to intentionally provide bad or negligent customer service. Bad customer service will cost any business. But being your true self can drastically set you apart. You just need to have the courage, as a company, to give yourself permission to be exceptionally diverse. Arnold Schwarzenegger once said, “The worst thing I could be is the same as everybody else. I’d hate that.” So why should companies give customers the same experience they could get anywhere else? They’d hate that. It’s a radically differentiated customer experience, maybe more than anything, that evokes an emotional response in your customers’ minds which keeps them coming back. It’s the notion that if brands can provide an experience that people can’t get anywhere else, that they’re operating in uncharted waters, and in their own niche. (The Blue Ocean Strategy discusses ways brands have successfully diverted to create their own space, rendering the competition irrelevant). They are relentless and hyper-focused on their own, well-defined ideology. Let’s, collectively, shift our ideology. Let’s move from providing isolated, monotonous interactions to creating meaningful and memorable experiences that ultimately culminate in a solution to the customer’s problem. After all, isn’t that what people want? Michael Becker is a content marketing strategist at Sharpen, a cloud-native contact center in Indianapolis. He graduated with a B.A. in journalism and communications from Butler University in 2014.